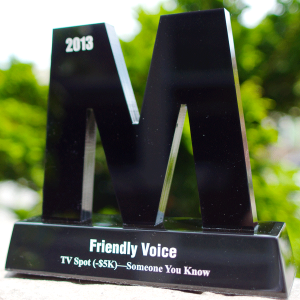 Friendly Voice Wins “Big M” Award for Stern Center TV | Friendly Voice, Inc. Friendly Voice, Inc. was awarded a "Big M" Award during The Event held last night at Seattle's Bell Harbor International Conference Center. The competition, organized by Marketing Northwest recognizes creative work produced in the Pacific Northwest region in Advertising, Public Relations, Creative Arts, Direct Marketing, Outdoor and more. According to Friendly Voice president Steve Lawson, "Our client, Dr. Fredric Stern and The Stern Center in Bellevue needed to stand out in a narrowly targeted cable TV buy. The budget was small, and the need for an upscale look drove us to use stock footage. The theme, Someone You Know Had a Little Work Done, was developed as a new way of delivering The Stern Center positioning statement "Creating Natural Appearing Beauty through the Art of Laser Cosmetic Surgery." The commercial was written, produced and edited by Steve Lawson of Friendly Voice, Inc. The voice-over announcer is Vera McKinney Kutz.